Inspired by this question on the Lucene user's list, I created a new codec in Lucene called the SimpleText codec. The best ideas come from the user's lists! The codec is read/write, and fully functional. All of Lucene's unit tests pass (slowly) with this codec (which, by the way, is an awesome way to test your own codecs). Note that the performance of SimpleText is quite poor, as expected! For example, there is no terms index for fast seeking to a specific term, no skipping data for fast seeking within a posting list, some operations require linear scanning, etc. So don't use this one in production! But it should be useful for transparency, debugging, learning, teaching or anyone who is simply just curious about what exactly Lucene stores in its inverted index. Mike, I'm confused as how to read using the codecs. I see that I can create an IndexWriter using an IndexWriterConfig that has a setCodec method, but I don't see any such method with the IndexReader class? The necessary codec is written into the index every time a segment is flushed or merged, by IndexWriter. So that at read time (when you open an IndexReader) you can't change the codec anymore; instead you just have to ensure all codecs used when writing that index are still on the CLASSPATH. IndexReader will look at each segment, determine which codec wrote it, find that codec in the CLASSPATH, and use it to open the segment. SimpleText codec ships with the "codecs" module (lucene-codecs). Mike, I've had a blast playing around with Codecs lately. Thanks for SimpleText, its very educational. I posted a blog article that hopefully can help others understand the basics of how a search engine works based on SimpleText's output. Hope you/your readers enjoy. That's a great blog post! Thank you for sharing! I am new to this Codec concept.Can you post example for how to convert index files to readable format?. 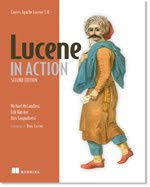 Can you please ask on the Lucene user's list (java-user@lucene.apache.org)?